I recently had a fun time being interviewed by Pam Worth from Gulf Radio Services for, "In All Directions", a program for British expatriates in Abudhabi, Bahrain, Doha and Dubai. Each clip is about 7 minutes long, so grab a cuppa and enjoy! Exhibition is open Monday to Friday, 9am -5pm, and Thursday evenings until 9:30pm. Wonderful day at Sedgwick! Artist John Thompson led an outdoor painting workshop in the beautiful garden before a delicious vegetarian lunch -optional swim in the outdoor pool, walk round the magnificent grounds, then Meg Thompson led a yoga session for us all to relax in the afternoon. Wonderful day-thanks to all. More will be booking soon! Prizewinners of The Art Apprentice competition based In Horsham enjoyed a free workshop at Roffey Park Institute with popular local artist John Thompson from Horsham on Wednesday 6 April. The Horsham girls, Hannah Couchman, Emily Johnson, Emily McFarling and Lara Rodwell, had previously exhibited their work at Roffey Park in Colgate, where favourite works were voted for by visitors and staff. A panel of local artists including Claire Phillips, Rosalyn Mina, Elizabeth Sharp and Jessica Palmer also judged the works. The teenagers, whose work was submitted via Millais School, The Art Academy and Collyers all enjoyed the day, and recognised it will help them build an art portfolio for applying to college later on. Morag Warrack, the organiser, said, "The interactive competition was enormously popular at Roffey Park, and the standard and variety of the work and thought processes behind it were fantastic. All the entrants really deserve to do well in the future." John, who teaches adult workshops at Nymans Gardens, was impressed with how the winners performed on the day. "The girls worked very quickly and efficiently, producing wonderful finished pieces in only three hours! They've learned many skills and techniques in a short, intense space of time. I'm very impressed with their commitment, enthusiasm and passion!" Many thanks are due to Roffey Park Institute for hosting the event, and to Foundry Press for providing A3 prints of the winners' work. These are some of the images of Helen's paintings. 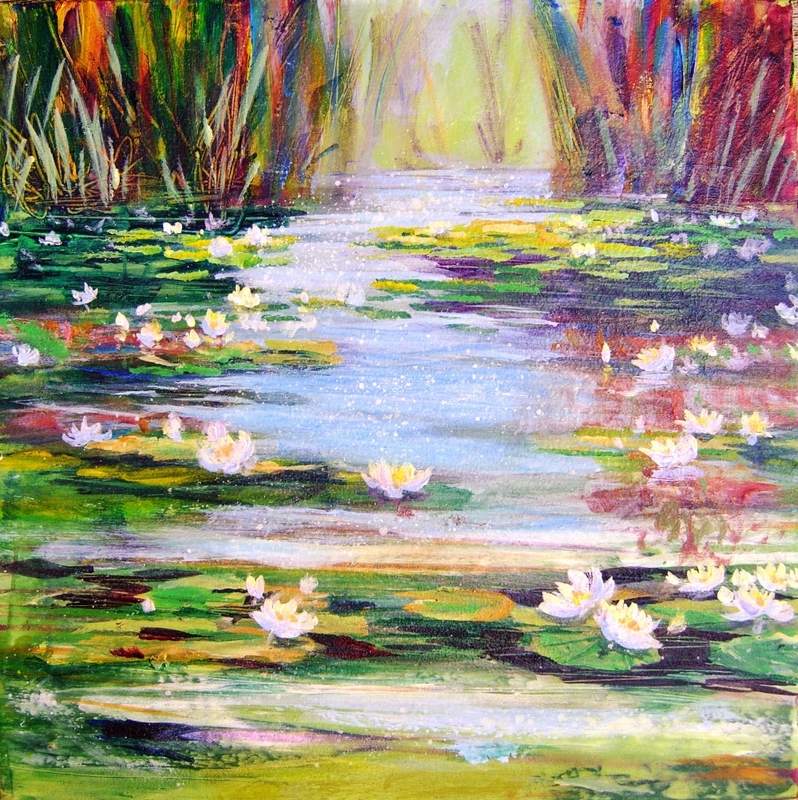 She works in oils and acrylics, sometimes adding collage or oil bar or oil pastels to the pictures. She is also a talented sculptor and has won competitions in her home city of Dublin, where her musical themed seat can be seen at Temple Bar. She currently teaches art and stone carving at Collyers College in Horsham. I loved being at Borde Hill Gardens' Green Tree Gallery for the opening of the summer exhibition "At The Water's Edge". I had the joy of chatting with Victoria Lovell, one of the enthusiastic partners, who told me the gallery opened in 2007 with the purpose of providing a space not only for the four partners to exhibit their own work but also to encourage other local artists. Enjoying this interaction with all sorts of artistically-minded folk and keen to encourage new artists and established local figures, the gallery shows an eclectic mix of many styles of work. Colourful paintings and prints are surrounded by jewellery, sculpture, books, ceramics, wood, cushions, scarves, embroidered gifts, glassware, and greeting cards. Victoria said, "Working with a theme is so inspiring. It's magic when all the random work comes together to make a coherent exhibition. It's so exciting- and particularly thrilling to promote new artists!" With this in mind, Victoria is planning an exhibition for young, emerging artists in the near future, with the possibility of liasing with local Ardingly College. Does she have any advice for young artists, I asked. DO YOUR RESEARCH. Read the gallery website information. FIND OUT HOW THE GALLERY LIKES TO BE APPROACHED... and do that...make that all important appointment! DON'T SPAM your own website at them. BE COURTEOUS and remember your all-important people skills. Thanks, Victoria- Good advice to us all! I made two copies of my sketch, one with lots of details like spring flowers and birds, and the other is a simpler version. This is a page from my little sketchbook. It's the view from the Sussex Farm Foods shop near Pulborough where I'll be hanging my paintings next month. It's such a gorgeous sweep of the Downs, and although it was a cold January day, the colours of the hills and fields were dramatic - I loved the way the dark trees made a vertical pattern in front of the bight green and purple. The little sketch is in watercolour, and I love the immediacy and the way the paint colour runs and blends in a way you don't neccessarily get with acrylic. It was just a few scribbled minutes to capture the view. This is the first stage of a much larger painting in acrylic that I'm working on from my sketch. When I arrived at Wakehurst yesterday, the friendly, familiar faces of Carole and Trevor D. greeted me. We had a good chat as always, and then to my delight, it turned out that it was Carole's birthday...and you can see what she chose as her present above! HAPPY BIRTHDAY, Carole! I hope you enjoyed your lunch date. I loved the dry stone walls which were full of gaps in them so when the light was behind them, it almost looked like lace! There were lots of curious young cows in the fields. Tree silhouettes on the skyline completed the picture. I'm really delighted that Sue has commissioned another painting, this time of Lancashire, to add to her collection. Watch this space! "Sometimes a painting reminds us of where we've been happy. Sometimes it is a glimpse of our dreams; of where we yearn to be." I've just set up a new exhibition of "West Coast" paintings at Roffey Park, Horsham, based on my recent travels in the UK. It includes inspiration from perfect places, uplifting experiences and awesome artists in Scotland, Wales and England. Many of the paintings are based on a journey to Skye that John and I took in October. Both my parents were Scottish, and I had wanted to go here for a long, long time. We were blessed with fantastic weather, and it felt like home. Have a look at the paintings in my new online gallery if you can't get to Roffey Park. Great step-by-step instruction from John at a recent workshop at Nymans NT gardens at Handcross in Sussex. We painted Chickens in the Apple Blossom Orchard. All twelve of us enjoyed ourselves & everyone did really well as usual! Amazing to achieve so much in a day, and coffee and cake thrown in too...can't be bad! I've been to Seawhite's factory shop at Partridge Green today to stock up on paints, sketchbooks, boards etc. When I was teaching art and textiles at secondary school, we always used to buy our sketchbooks there -as so many schools and colleges do! The staff are knowledgeable and helpful, and I was delighted to see their range of art materials has recently expanded into a second room. There is an art exhibition at the back and some interesting paintings and information about local events in the foyer. I have always found their products to be very good quality but at wholesale prices. Has anyone else got a favourite supplier?